Steeping Instructions: Use 1 teaspoon per brew. Heat water to boiling (210 degrees Fahrenheit / 98 degrees Celsius), and steep for 4 minutes. Lydia Had More Fun tickles my sights with its contrast of robust reddish-brown rooibos and shreds of snow-white coconut. There’s more rooibos than coconut, maybe 75% of the former and 25% of the latter. Also, the coconut used here isn’t the hard or freeze-dried stuff. Instead, it’s the good kind of coconut: the fresh, softer shavings you’ll find in bags at your local grocery store or sprinkled on desserts and pastries. I’m curious to see how this affects the taste and texture of the brew. First, I open the packet of Lydia Had More Fun and smell… DESSERT. The coconut aroma blooms through and mingles with the woody rooibos scent. It’s bold and creamy, with a decadent sweetness that reminds me of frosting – specifically carrot cake with cream cheese frosting. I’m not joking! There’s a confectionary quality here that’s uncharacteristic of rooibos teas. Which makes me wonder: Will the tea taste too sweet for my liking? 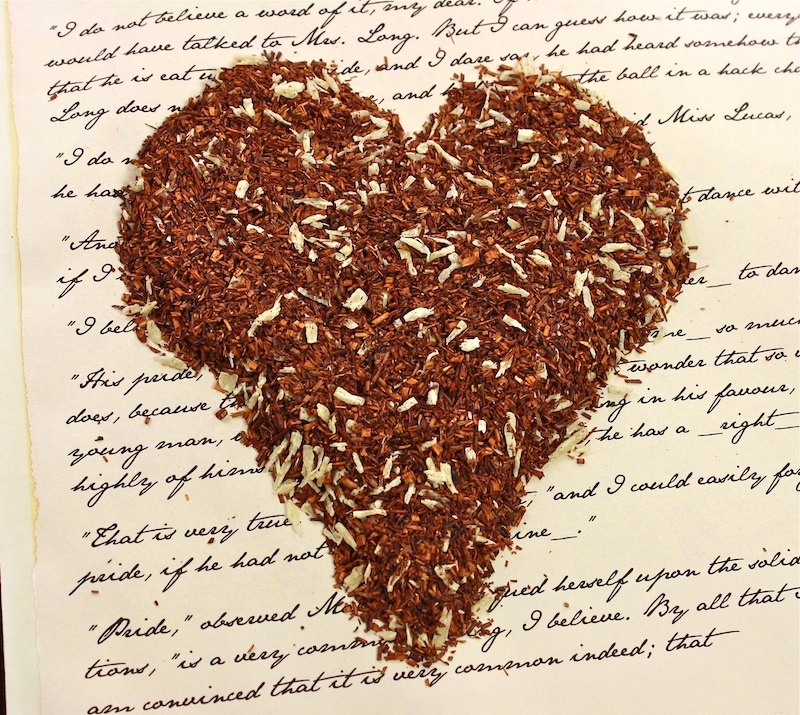 How will the coconut and rooibos flavors harmonize in the cup? Only one way to find out. Following Bingley’s instructions, I steep 1 teaspoon of Lydia Had More Fun in boiling water for 4 minutes. The infusion looks like a typical cup of rooibos, a healthy and dark reddish-brown. The aroma is now a more subdued balance between rooibos and coconut, but maintains that unique confectionary sweetness. Each sip of Lydia Had More Fun ushers an instant creaminess. The thick, velvety mouthfeel is definitely a result of the fresh coconut, which I can taste along with the well-rounded, complex rooibos flavors. In fact, I think the coconut strengthens the rooibos taste. I don’t find the tea particularly sweet, though – until the aftertaste arrives. It coats my tongue and lingers like frosting. I like it well enough, but I also need a glass of water or a cup of white or green tea to wash it down. Now I’m glad I waited until after dinner to brew More Fun. The tisane’s texture and finish make it too rich for any other time of the day. Speaking of luxury, Bingley’s recommends adding cream to Lydia Had More Fun “if you’re feeling extra extravagant”. I don’t usually have cream at home, but for curiosity’s sake I added a splash of milk to one cup. Doing this accentuates the tisane’s satiny smoothness and tempers the heartiness of the rooibos. And if it were cream instead of milk – oh yes, it would enhance the brew’s flavor and body. Once again, Bingley’s Teas serves up an accurate “tea reflection” of one of Jane Austen’s characters. Lydia Had More Fun flirts with its sweet coconut-rooibos perfume and entices with its full flavors and indulgent smoothness. And thanks to its mouth-wateringly sweet finish, it’s a true confection tisane. This would be a fun choice to spruce up your afternoon tea party, or to enjoy after dinner either alone or with a fruity dessert, pastries, or extra dark chocolate. I wouldn’t recommend More Fun for earlier in the day; it’s more of a luxury than most herbal teas. But this is a lovely change of pace, and the most “fun” you’ll have with rooibos without adding actual sugar to your cup. Possible Book Pairings: Pride And Prejudice, of course! I could also see it working for Sense and Sensibility, as well as book club reads like Lorna Landvik’s Angry Housewives Eating Bon Bons or YA romance or contemporary fiction. You can purchase Lydia Had More Fun directly from Bingley’s Teas here. 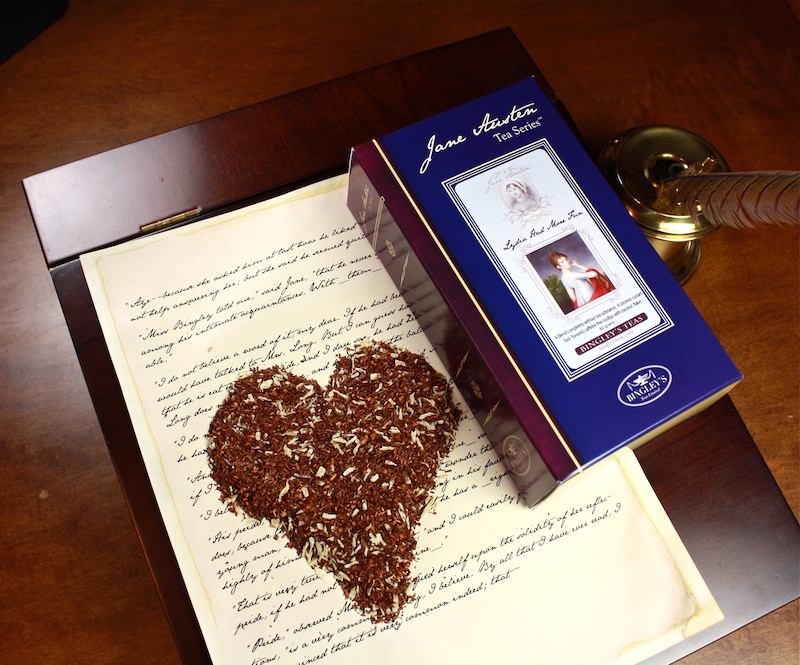 Looking for a fun, more “dressed up” rooibos tisane? Lydia Had More Fun from Bingley’s Teas might be a great choice then. It mixed red rooibos with freshly shaved coconut for an indulgent, dessert-like herbal tea. Find out more about Lydia Had More Fun – and which Jane Austen character inspired this tea – at my newest tea review at A Bibliophile’s Reverie! I used to do a Tuesday Tea for our website before I had to take a hiatus. I am so glad that I am not the only one who talks about books and tea! Tea is just about the only way I can handle coconut. I will have to try this blend. When you say “our website,” do you mean Bibliosanctum? Or a different one? Yeah, I definitely meant the Bibliosanctum. I should’ve been clear. I’d started doing them around the time we started doing the site together. Then, I had a very rough year due to health reasons and had to put that on hold along much of my reviewing and interacting, but I’ve been thinking about starting it (Tuesday Tea) back up. However, I’d wanted to revamp it a little *if* I started it back up. But I really just trying to catch up more with old reviews and visit out visitors’ sites in general because missed so much during my hiatus. So, you’ll probably seem me lurking about. LOL. I’m glad to hear you’re feeling better (I’m assuming you are if you’re back in blogging action?). Feel free to lurk as much as you like!